I just wanted to say a big ‘THANK YOU!’ to everyone who got involved in Small Charity Week in Dudley borough and to highlight the organisations that joined in our conversations. We had quite a few conversations online and some busy activities that I really hope were useful and stimulating for everyone that joined in. It’s great to invite anyone involved in the voluntary and community sector (or anyone that wants to learn more about it) to the brand new Bostin Summer Camp! We’re looking for people with a passion for the voluntary and community sector to join us on the day. What on earth is Bostin Summer Camp? Bostin Summer Camp is a new event for people that have an interest in Dudley borough’s voluntary and community sector organisations to connect, listen and learn from each other. So if you’re from a voluntary and community sector organisation or if you’d like to know more about the changes, challenges and opportunities they are responding to in Dudley borough, then Bostin Summer Camp is for you! The event will be run as an unconference. This means there won’t be an agenda set before the day so participants get to decide what’s important to talk about on the day. All you need is a desire to learn. Lorna, who’s co-organising Bostin Summer Camp has participated in a few unconferences now and has written about why she loves them! I’ve been involved in one unconference so far (VCSSCamp) and I love how open, unpressured and collaborative they are. Come along to Bostin Summer Camp on Thursday 21 July, join in the discussions as you please, make connections and learn. You can book your place here. It’s completely free to attend and you don’t need to be from Dudley borough or the voluntary and community sector. Be a co-organiser: Don’t worry, we wont ask you to do too much! We already have a date and a venue. It would be awesome if people could join us in promoting the event, sharing on social media, being a friendly face to welcome people on the day, helping to facilitate building the agenda on the day etc. If you’d like to chip in, please do let us know! Pitch a topic on the day or get discussing possible topics on the Bostin Summer Camp blog or by tweeting with the hashtag #bostinsummercamp. There’s no need to wait until the event to join the conversation! Whether you’re from an existing voluntary group, charity or social enterprise, or you’d like to do more to support your community, come along to get your questions answered, generate ideas and feel supported all over a friendly cuppa! Drop in on us anytime between 10am and 1pm in the coffee shop area of DY1, Stafford Street, Dudley, DY1 1RT. This will continue on the first Wednesday of every month. We’re looking forward to meeting you there! Since taking on Brierley Hill Civic we’ve found that everyone from local small groups to international music promoters are very excited in the work we’re doing to bring new life into this amazing building. We took on on the Civic in February and we’ve had great support from the council, staff at the Civic, businesses and charities, all helping us in the early stages of this exciting journey. 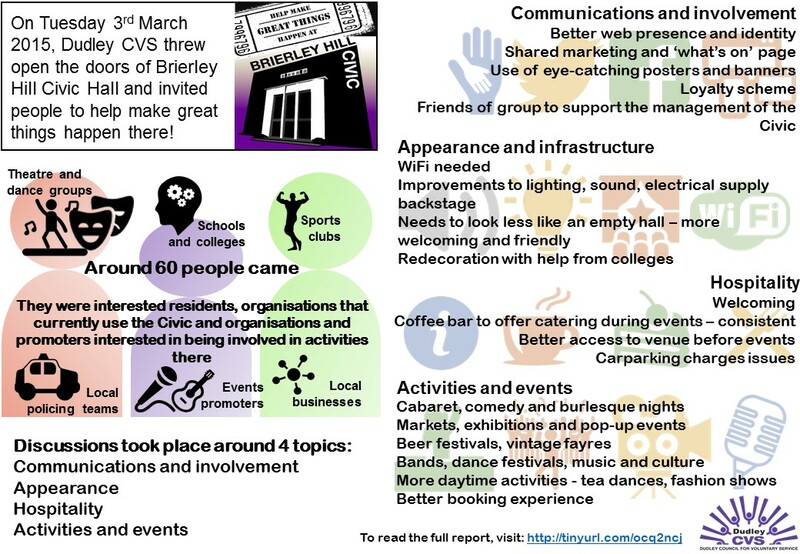 In March we kicked off with an open day to learn more about what the community, organisations, schools and businesses want from their Civic Hall. Lye & Wollescote Chapels, Cemetery Road, Lye. 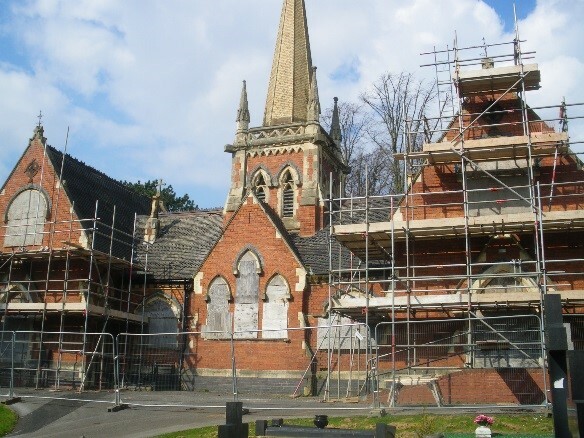 As many of you may be aware, Lye & Wollescote Chapels was the first building in Dudley borough to undergo the Asset Transfer journey. Since then there have been others and I am happy to report, more on the way and as and when they do happen, we will keep you posted. Small Charity Week (15th-20th June) celebrates and raises awareness of the essential work of small charities (defined as charities and CICs that have an annual turnover under £1.5million). I am pleased to share some information with you on a series of events we are co-hosting with Simon Hall from the Black Country Consortium. These events will help you to learn more about the funding opportunities that will become available through European funding in the future. The briefing will outline both the ESF/Big Lottery priorities and the expectations of the Black Country LEP around each of these themes and how you could potentially get involved. To book please click on the appropriate link above. On Tuesday 3rd March, Dudley CVS welcomed the community into Brierley Hill Civic Hall to gather people’s visions for building it into a vibrant hub for a variety of activities and events. 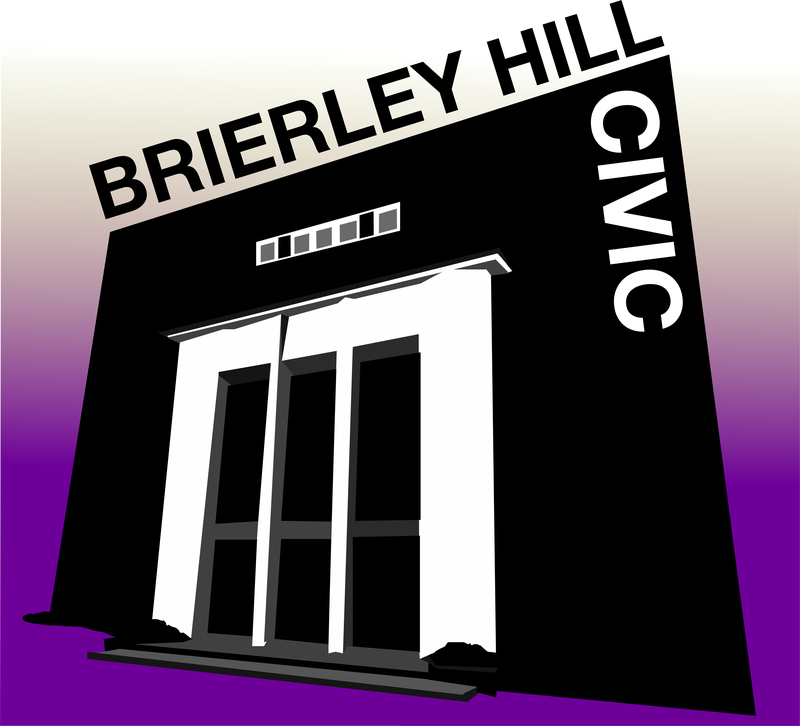 On Tuesday 3rd March, 2pm-4pm, we’ll be throwing open the doors of Brierley Hill Civic Hall to anyone who would like to help us bring this wonderful venue to life. 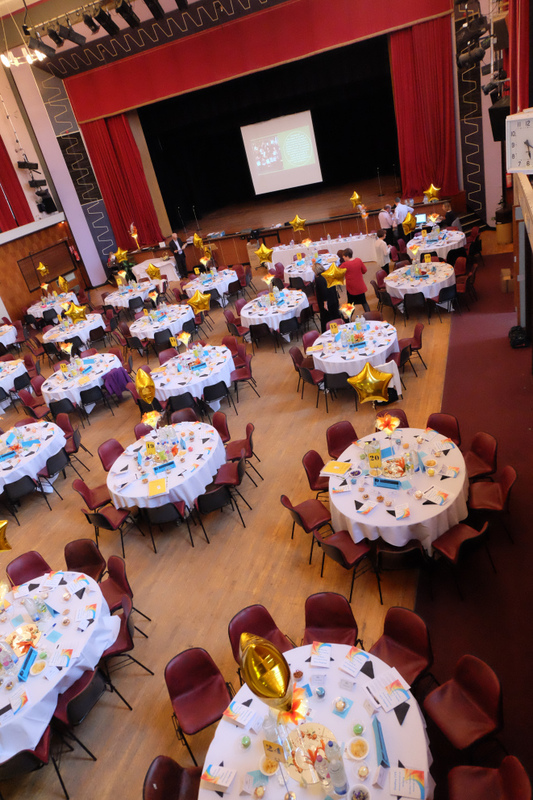 Whether you’re a resident, an artist, entertainer or promoter, or if you belong to a business, college, voluntary group or charity, you’re welcome to come along and see the Civic Hall’s potential for yourself. I’m really looking forward to meeting people who want to make great things happen at the Civic Hall, ask questions, tour the space and share their ideas and inspiration. There’s so much potential for Brierley Hill Civic Hall to become home to many more groups and activities, particularly during the daytime. Since my last post, we’ve already had some great ideas ranging from socials for older people, vintage cinema events, linking with local businesses, and I want to thank everyone that’s shared their ideas so far. We want to encourage local talent to use the Civic Hall as a showcase venue for their skills; we want to make sure that the Civic reflects local heritage and is a vibrant community hub for everyone. So please join us at Brierley Hill Civic Hall on Tuesday 3rd March, 2pm-4pm, to share your ideas over light refreshments. If you can’t attend but would still like to share your ideas, please join in the conversations here by making a comment, on Twitter or on Facebook. Alternatively, you’re welcome to contact me on 01384 573381. Dudley CVS will take on the running of Brierley Hill Civic Hall from next month in an arrangement that aims to make the venue an exciting hub and to make Brierley Hill a vibrant destination for entertainment and leisure. More than just bricks and mortar; community assets are about the people and activities they attract. 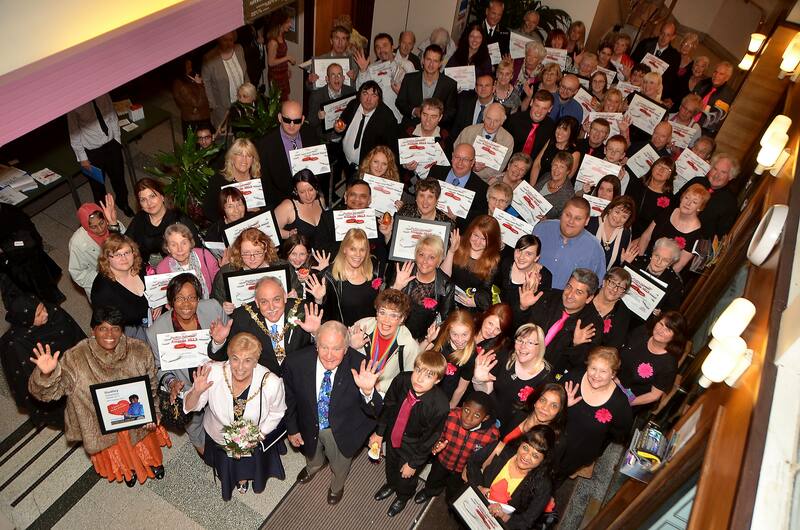 This photo is of Volunteer Award winners packed into the foyer of Brierley Hill Civic Hall.